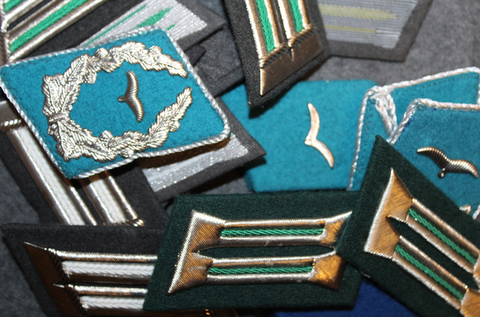 Original East-German collar tabs. unissued, nice condition. Sold as pairs. 1. Gray-white, canvas tabs, enlisted men, NCO, infantry. 2. Gray-green, canvas tabs, enlisted men, NCO, supply. 3. Gray-olive, canvas tabs, enlisted men, bausoldat. 4. Gray-white, metal + canvas tabs, officer, infantry. 5. Gray-green, metal + canvas tabs, officer, supply. 6. Green-green, metal + canvas tabs, officer, police. All are unissued, and in nice condition. There is lots of variation in reverse sides of the tabs. Most of these are most likely 1970s and 1980s production. Some of these would be good for re-enacment uniforms as they resemble wehrmacht tabs greatly. Collar tabs ( kragenpatten ) Swiss fire dept.